You can do this on the stovetop, but I use the microwave. 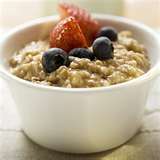 Mix the oats with the milk and berries and microwave on high for about 3 minutes. Mix well. Add the protein and flaxseeds. Stir. Enjoy!